In A Convenient Windfall: Global Warming’s Big Cash Dividend, published on March 23, 2007 at www.commondreams.org, Peter Barnes makes the excellent points that “we need to make polluters pay for fouling the atmosphere” and that “we’ll earn an enormous cash windfall if we fight global warming the right way.” Unfortunately, his “right way” is a cap-and-trade program. Barnes concludes that the permits should be auctioned rather than given away. The danger is obvious. When it comes to making deals in Congress, the coal-mining companies and the companies burning coal have tremendous clout and the inevitable result will be a cap-and-trade program with the allowances given to the polluters along with the cash windfall. The good news is that we really can earn an enormous cash windfall by fighting global warming the right way. That right way is by implementing a carbon tax, which is superior to cap-and-trade programs for all the reasons set forth in our issue paper on Carbon Taxes vs. Cap-and-Trade. 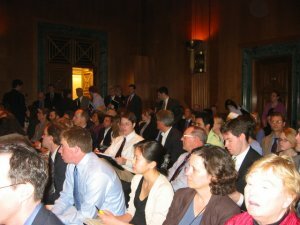 Close to 150 Congressional staffers, policy types and lobbyists jammed a Senate hearing room yesterday for a briefing on carbon taxes and cap-and-trade systems featuring CTC’s Charles Komanoff, along with Terry Dinan of the Congressional Budget Office and James Barrett of Redefining Progress. The briefing was sponsored by the Environmental and Energy Study Institute. Attendance at EESI briefings generally runs between 75 to 100, and the packed house for the March 14 panel was taken as a sign of surging interest in carbon pricing. Charles’s presentation may be accessed here. It’s an updated and more concise version of the PowerPoint on our Home Page. Cap-and-Trade: Part of the Solution or Part of the Problem? As yet another case of cowboy diplomacy on the part of the Natural Resources Defense Council and Environmental Defense recedes in the rear-view mirror, it’s important to look ahead to what is at stake here. In a little less than two years, our current Federal executive branch will be replaced. Chances are that for the first time, we will see serious movement (as well as serious posturing) on a Federal level about limiting greenhouse emissions. The problem is that the stakes are enormously high, and the window of opportunity for doing something that will actually make a difference is very small — less than a generation, probably less than a decade. We don’t get a mulligan if we blow this. Many of our nation’s most polluting industries are acutely aware of this political calculus, and are moving to get in front of the issue. The first effort out of the gate is the US Climate Action Coalition. In addition to NRDC and ED, it includes perennial favorites like PG&E, Duke Energy, FPL, Caterpillar, GE, BP, Alcoa, and more. Now, all of these corporations are looking for policy certainty before making infrastructure plays that they will have to live with for most of this century. Some of them buy into the idea that climate change is the single biggest threat that we as a species face in this next century, and that we need to act like it (I would put BP in this category). Others are simply looking for a way to make a financial killing, or evade having to actually do very much. Of course, every party in this coalition intends to dominate the debate over how we actually go about substantially reducing greenhouse gas emissions in the United States. So, what are they calling for? Their twelve-page “solutions-based” PR piece, A Call for Action, is long on rhetoric and short on specifics. But the specifics that are there should make you sit up and take notice. The short-term and mid-term suggested target reductions, not to put too fine a point on it, are lame: 10%-30% reductions from current levels by, oh, around 2025. To put that in context, California plans to reduce emissions 15% from current levels by 2020, and 80% by 2050. The UK committed to 20% reductions below 1990 levels by 2010 a decade ago (they will probably get close to, but not quite hit that target). Both the UK and Germany have committed to further reductions on the order of 40% by 2025 if — and this is a very important if — the US makes a similar commitment. A significant portion of allowances should be initially distributed free to capped entities and to economic sectors particularly disadvantaged by the secondary price effects of a cap including the possibility of funding transition assistance to adversely affected workers and communities. Free allocations to the private sector should be phased out over a reasonable period of time. A few days ago I was asked to elaborate on why implementation of the Clean Air Act and the failure of Phase One of the European Carbon Exchange are great examples of how to do the wrong thing with mitigating carbon. Furthermore, the decision to give sulfur dioxide credits away to polluters, instead of going to a 100% market-driven auction system, represented a huge subsidy (and another terrible precedent) for the nation’s dirtiest utilities. Make no mistake, this is the deal that NRDC/ED’s partners in USCAP are aiming for. Phase One of the Euro Carbon Exchange failed for two reasons: each country was allowed to make its own estimate of its greenhouse emissions, and tradable carbon credits were given, for free, to the industries in each of those countries. The three countries that actually underbid (UK, Spain, Slovenia as I recall) had to actually pay. For the rest of the Eurozone, it was free money right up to the point where everybody realized that the market was awash in surplus carbon credits, and the price dropped by 95%. They did learn a lot about how much carbon each country actually generates, and Phase Two should be tighter. But less than 10% of the available credits in Phase Two will actually be in open auction. Once again, the vast bulk of credits will be given away to polluting industries, something that my sources in the UK government describe as a straight-up political power play by Europe’s largest corporations. That’s the reality we’re all up against as we start to gear up for the critical fight to reduce global warming. What is troubling is that NRDC and ED have already signed onto Alcoa’s and Duke Power’s position on climate change, before the real discussion has even started. For better or worse, NRDC and ED are the go-to national environmental organizations that corporations want to talk to. Occasionally the outcome has been positive. More often the result has been catastrophic. But always NRDC and ED seem fixated on a style of cowboy diplomacy that forecloses a substantive and genuinely progressive outcome, often for years to decades. We don’t have years to decades to get this one right. I really, really hope that NRDC and ED don’t end up being part of the problem. 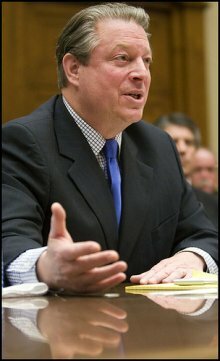 ‘Is the price of reversing global warming too high?’ asked Neal Conan, host of Talk of the Nation on NPR. Save for conservative columnist Jonah Goldberg – ‘I’m not worried about any problems the world will face 500 years from now,’ when prosperity will presumably cure all ills – Conan’s guests offered pragmatic replies. Barry Rabe, senior fellow at the Brookings Institution, shed light on what Paul Volcker recently called the ‘fundamentally false’ choice between carbon constraints and economic growth. According to Rabe, many states and nations that have already acted against global warming have seen their economies expand unabated, while governments that have sanctioned environmental business-as-usual have instead presided over business decline. ‘We’re positioned at a very interesting moment in the U.S., especially given the Congressional focus on [global warming], to think about what some of the policy solutions might be…. I hope that we can raise the level of discourse,’ said Rabe. In short, the price of reversing global warming is comparably cheap. The only meaningful question is which method of payment we prefer. That’s from a front-page article, Oil Innovations Pump New Life Into Old Wells, in today’s New York Times. The article uses Chevron’s Kern River oil field near Bakersfield, CA, whose life has been extended by injections of high-pressured steam, as a template for how advancing technology and profit opportunities from today’s higher oil prices are combining to increase recovery rates at oil fields around the world. The bottom line: peak oil will come some day, but not soon enough to avert climate catastrophe. I’ve long maintained that “peak oil” wouldn’t be a climate lifesaver. 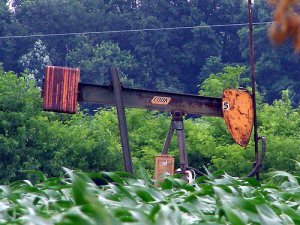 In my first talk centered on carbon taxing, at the “Philly Beyond Oil” meeting in 2005, I noted that $70 crude would “stimulate conservation, extraction and substitution,” and that only the first of this trio (conservation) would be a climate-helper. Quoting the trenchant economics writer Doug Henwood, I cautioned that there’s “no shortcut around political agitation,” which is why Dan Rosenblum and I founded the Carbon Tax Center earlier this year. The Times article closes by quoting a Chevron engineer: “peak oil is a moving target [and the supply of] oil is always a function of price and technology.” True enough. Our task is to make the use of oil, coal and gas a function of a climate-aware price and technology. At present, the fuel prices that determine the demand side of the equation include nothing for the climate damage resulting from burning those fuels, resulting in vast overuse. Moreover, those feedback mechanisms I mentioned in my 2005 talk invariably overshoot the mark, resulting in the kind of wild price swings that Yergin described. These fluctuations drown out underlying movements toward higher prices, frustrating investment in low-carbon alternatives on both the demand and supply sides. What to do? A tax on carbon fuels will internalize the costs of carbon damage and make manifest today the long-term trajectory of rising carbon-fuel prices. No other policy option – not cap-and-trade, not fuel efficiency standards, not subsidies for renewables – can do that. were going to fly off the oil mountain. Instead we had a boom and oil went to $10 instead of $100." agitation," which is why Dan Rosenblum and I founded the Carbon Tax Center earlier this year. The Times article closes by quoting a Chevron engineer: "… peak oil is a moving target [and the supply of] oil is always a function of price and technology." True enough. Our task is to make the use of oil, coal and gas a function of a climate-aware price and technology. burning those fuels, resulting in vast overuse. Moreover, those feedback mechanisms I mentioned in my 2005 talk invariably overshoot the mark, resulting in the kind of wild price swings that Yergin described. These fluctuations drown out underlying movements toward higher prices, frustrating investment in low-carbon alternatives on both the demand and supply sides. What to do? A tax on carbon fuels will internalize the costs of carbon damage and make manifest today the long-term trajectory of rising carbon-fuel prices. No other policy option — not cap-and-trade, not fuel efficiency standards, not subsidies for renewables — can do that. Quoting Lenin, WSJ Editorializes on "Cap and Charade"
rent-seeking with a climate-change patina. that would mean they could sell them, and make money off something that previously wasn’t worth a dime. Of course, if the cap isn’t set low enough there won’t be the type of emissions reductions needed to avoid climate disruption. Similarly, if the government auctions off additional allowances if allowance prices increase over a predetermined amount, the "safety-valve" requested by many companies, then it won’t really matter how high or low the cap is set. You can bet that most of the corporate proponents of cap-and-trade will be fighting for a cap that costs little or nothing, but allows them to say they care about the environment. Moreover, the WSJ editorial doesn’t even mention most of the problems with cap-and-trade. If the U.S. ends up with a cap-and-trade system there will be profit-making opportunities for some alert companies, a lot of self-congratulations by cap-and-trade proponents, but CO2 emissions will keep growing. As the WSJ concludes, "don’t believe for a minute that this charade would do much about global warming." ‘The world is experiencing climate disruption now and the increases in droughts, floods, and sea level rise that will occur in the coming decades will cause enormous human suffering and economic losses. The poorest are likely the most vulnerable. We imperil our children’s and grandchildren’s future if we fail to improve society’s capacity to adapt to a changing climate,’ according to Rosina Bierbaum, former Acting Director of the White House Office of Science and Technology Policy, announcing the findings of Confronting Climate Change: Avoiding the Unmanageable and Managing the Unavoidable. The report was prepared by the United Nations Foundation – Sigma Xi Scientific Expert Group on Climate Change, and released on Feb. 27. ‘The global-average surface temperature has already risen about 0.8 deg C [1.4 deg F] above pre-industrial levels and is projected to rise another 2-4 deg C [4-7 deg F] by 2100 if CO2 emissions and concentrations grow according to mid-range projections. Prudence dictates limiting the average temperature increase to no more than 2-2.5 deg C [3.6-4.5 deg F] above the pre-industrial level, and our report offers clear recommendations for achieving that goal,’ said John Holdren, the Teresa and John Heinz Professor of Environmental Policy, Harvard University, Director of the Woods Hole Research Center, and Board Chair of the American Association for the Advancement of Science. Friends of the Earth – Canada and Corporate Knights Magazine provided a model for United States environmental groups on Feb. 28 by releasing a detailed plan for climate protection that includes a carbon tax. As stated by Toby Heaps, Corporate Knights Editor-in-Chief and Friends of the Earth-Canada Board Member. “Our climate protection plan is unique and compelling?it taxes carbon emissions, and uses the funds to mobilize a massive redeployment that would trigger Canada’s green industrial revolution.” While the Carbon Tax Center recommends progressive tax-shifting or a rebate in the United States, we defer to our friends in Canada as to what makes more sense in their country. Congratulations and good luck!